Really enjoyed working with Alena. Had a big problem finding my Dream Dress, but thanks to Alena I got exactly what I wanted. I was totally impressed how inspired she gets working with a client! I wanted to have absolutley unique dress so thank you very, very much Alena — you made my dream came true! Alena Fede is an exceptional designer and her work speaks for itself! 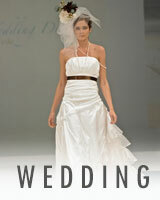 Her wedding gowns deliver elegance and beauty, which is what every bride wants. I would highly recommend her gowns for all brides because they are high quality. Linda V.